People have been using turmeric to cook and cure health problems for thousands of years. Moreover, thanks to its bright yellow color, turmeric has also been used widely for religious purposes. You can find turmeric used in a wide variety of cuisines, especially Indian. Related to ginger, the turmeric plant is not as widely used in the US but should be as it has many great health properties. Therefore, for those who want to get a concentrated dose of turmeric without forcing themselves to cook with it every day, the Qunol Liquid Turmeric Curcumin is an ideal dietary supplement to accomplish that. Each serving of this product provides you with a proprietary mix of turmeric curcumin complex. Of course, very few people like the pungent taste of raw turmeric. This product is naturally flavored in tropical orange so that you don’t have to taste the strong turmeric flavor. 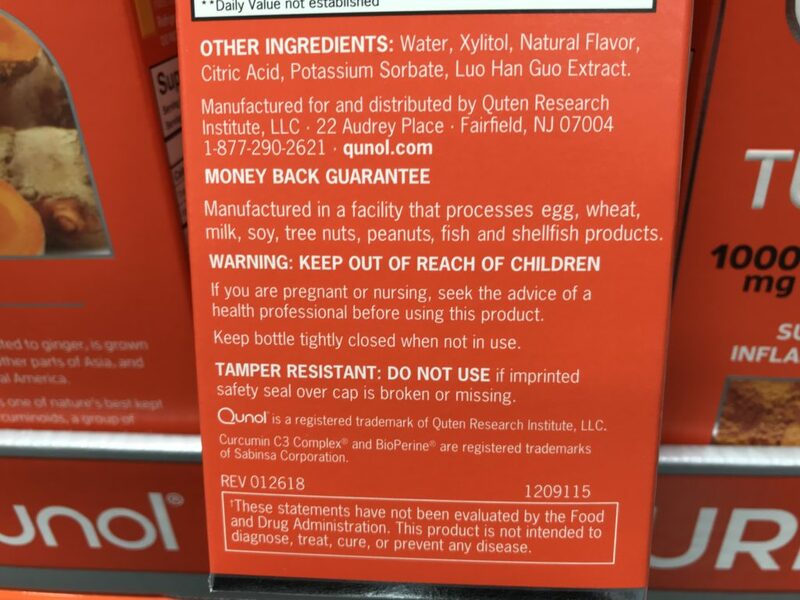 Item name: Qunol Liquid Turmeric Curcumin. Helps support a healthy response to inflammation. Primary ingredients: Curcumin C3 turmeric (at 95% curcuminoids). This is a proprietary turmeric from Qunol including: Glycerine. Acacia gum. Xanthan gum. Guar gum. Black pepper extract (Piper nigrum). BioPerine (at 50:1 ratio). Other ingredients: Water. Xylitol. Natural flavor. Citric acid. Potassium sorbate. Luo Han Guo extract (a sweet fruit for sweetening). Allergen information: This product was produced in a factory that also processes egg, wheat, milk, soy, nuts, and fish products. 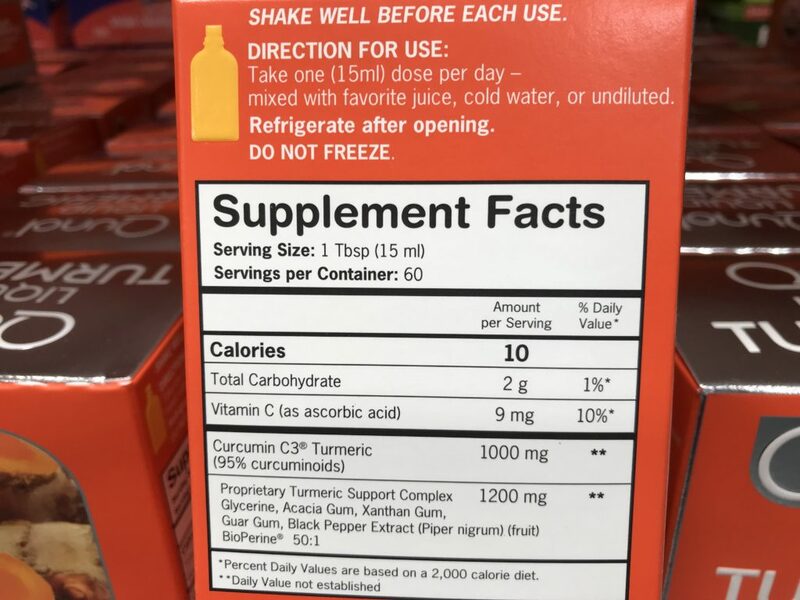 A serving size of Qunol Liquid Turmeric Curcumin is 1 tablespoon (about 15 ml). Each container has approximately 60 servings. Each serving has 10 calories and there’s also about 10% of vitamin C (daily value). Do not freeze this liquid Turmeric product! However, you should refrigerate after first use. 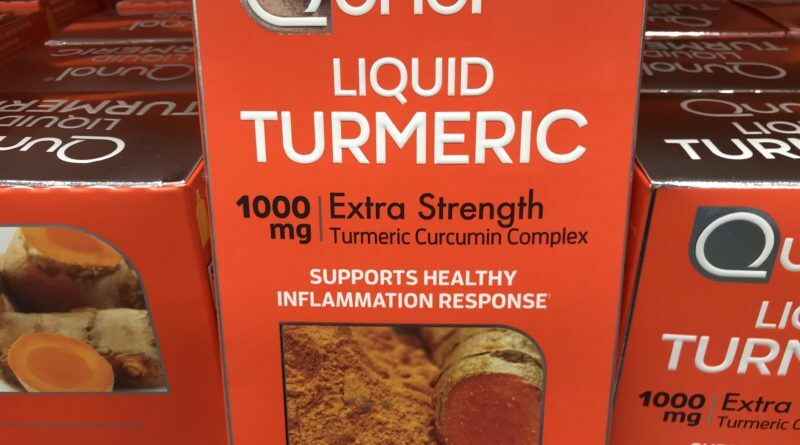 Each serving of this liquid turmeric contains antioxidants called “curcuminoids.” Specifically, this group of antioxidants support joint health and is anti-inflammatory. Many other liquid turmeric products only contain 5% curcuminoids but Qunol has 95% curcuminoids per serving. Additionally, the ingredients include BioPerine, which is an extract from black pepper that helps with digestive absorption. The black pepper also helps increase bioavailability for your body to use. You should consider trying this product if you have chronic inflammation. This could be due to surgeries or rigorous exercises. You may also have arthritis and want a supplement to help manage your symptoms. Consult with your doctor before using as dietary supplements aren’t meant to treat anything. Looking to Purchase Qunol Liquid Turmeric Curcumin? In case you are looking for this at your local store, most Costco warehouses currently have this item in stock. Based on my research, Amazon has this item in stock at the best price with shipping included. 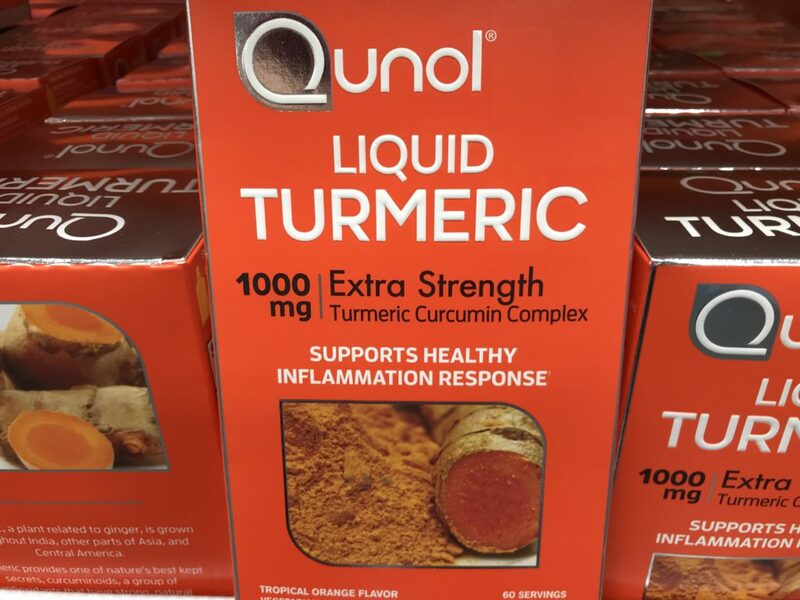 Have you bought the Qunol Liquid Turmeric Curcumin before?